The Tutor/Mentor Connection (T/MC) and Tutor/Mentor Institute, LLC are the same organization, with the same mission. Just a different tax structure. Phil Simon wrote a book titled The Age of the Platform showing how Google, Facebook, Amazon and Apple have created business models that support the actions of millions of users. A few years ago I read the book titled The Spider and the Starfish, in which the author told how Wikipedia and eBey were platforms supporting millions of owner-users. 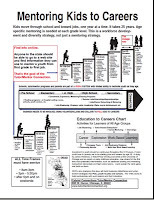 This graphic illustrates how the web sites of the Tutor/Mentor Institute, LLC are intended to be a social problem solving platform that can be used by people throughout the world who focus on the challenges poor kids face in moving from birth to jobs and careers over the first 20 to 30 years of their lives. The PRIMARY Focus of this platform is to help inner city youth connect with adults and a wide range of experience, enrichment and career-focused learning opportunities in organized, non-school tutor/mentor programs operating in every high poverty neighborhood of the city. However, the strategy shared here can be applied to any social, economic, health and/or environmental problem that challenges people in different places of the United States and the world. d) ways to point the efforts of the group to places within geographic boundaries where the ideas and action can support constant improvement, or betterment, resolution of the problem. This entire web site and all of the other web sites and blogs that we host are part of this strategy. If you want to help improve schools, reduce violence, close the gaps between rich and poor, one step you can always take is that of a "network builder". Connect the people you know to this web site. Sign them up for the email newsletter. Encourage them to set aside part of their charitable giving to fund the on-going operations of one, or more tutor/mentor programs in Chicago. See news stories resulting from T/MC activities. Our slogan is "if it is to be, it is up to me." We have made a commitment to support tutor/mentor programs in the Chicago region. However, we are doing this with a fraction of the money needed to serve the third largest urban area in the country. If you'd like to be involved in creating and leading the new Tutor/Mentor Connection and/or Tutor/Mentor Institute, LLC, email tutormentor2@earthlink.net or connect with Daniel F. Bassill on Skype (user dbassill). Thank you to everyone who has support the growth of the Tutor/Mentor Connection since 1993 and those who have made continued donations since 2011. While the Tutor/Mentor Institute, LLC (which now fully operates the T/MC) is not able to accept tax-deductible donations we still are in need of financial support, investments and sponsorship. Open this page to find a PayPal button you can use to make a contribution. Sign up for our newsletter. Connect on Twitter or Facebook. Receive monthly updates and fundraising information.